If you've read any of my posts before, you might have gathered I'm not the world's biggest hard rock fan. I make the odd exception ('80s Bon Jovi, Foo Fighters), but I generally like things on a pop, dance or R&B tip, and my rock down the softer end of the spectrum. In 1988, that taste in music meant I came in for a certain amount of ridicule at school (I was in Year 8 at an all boys school) - and this week that year saw the arrival on the ARIA chart of a band the cool kids championed. I was pretty disinterested in Guns n' Roses, but at least it was a change from the constant adoration of U2 and The Doors. 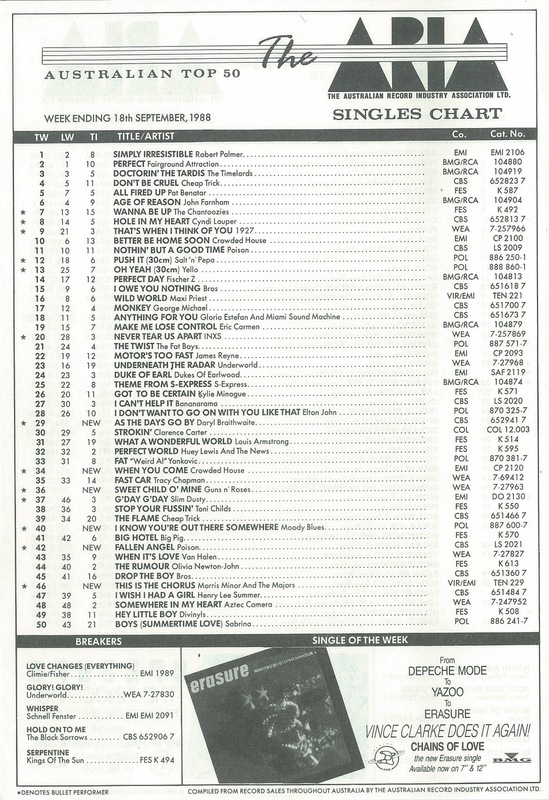 Also this week in 1988, a song adored by most people (although not me) climbed to number 1. Robert Palmer's "Simply Irresistible" would go on to spend five weeks at the top and become one of the year's biggest sellers in the process. Theoretically still park of The Beach Boys (who'd make a huge return to the chart later in the year), founding member Brian Wilson didn't receive the same welcome with this single from his self-titled debut solo album. Speaking of number 1s, this track was not only my favourite song for 1988, but also my top song for the entire decade of the '80s. And I have the ARIA chart to thank for drawing my attention to it. I was aware of Erasure due to their previous top 50 hits, "Sometimes" and "Oh L'amour", but I probably wouldn't have been aware that "Chains Of Love" was released without the prompt at the bottom of the chart, since the British duo received very little other promotion in Australia. As a result, the second single from The Innocents album didn't even make the top 100 here. Quite a different style of song to "Underneath The Radar", "Glory! Glory!" slows the pace right down and gives even less of an inkling of the electronic direction the band would take in the '90s. After taking the mickey out of rap music with "Stutter Rap (No Sleep Till Bedtime)", the British comedic trio now turned their attention to music's most successful triumvirate: Stock Aitken Waterman. "This Is The Chorus" referenced SAW hits like "Respectable" and "I Should Be So Lucky", while the video featured Tony Hawks and pals dressing up as Bananarama, Rick Astley, Mel & Kim, Kylie Minogue and SAW themselves. Interestingly, the likes of Dead Or Alive, Sinitta and Divine were spared from the satire - and this song was released one year too early to encompass the eminently lampoonable Reynolds Girls, Sonia and Big Fun. Also curious: although "Stutter Rap" had been a huge success in the UK, "This Is The Chorus" flopped there (missing the top 75 entirely), despite SAW being even more inescapable than they were in Australia. But, the Kylie backlash was in full swing here and any excuse to make fun of the Neighbours star was embraced wholeheartedly by certain parts of the Australian public. With Bon Jovi between albums, the even-more-glam Poison happily stepped in to become Australia's favourite long-haired, leather-clad rock group - and "Fallen Angel" followed "Nothin' But A Good Time" up the chart. But, as we'll see in a moment, their time in the sun would be overshadowed by a harder, more credible rock act. Meanwhile, the "Fallen Angel" music video featured a classic hard rock tale: good girl leaves home, turns out to not be so good. With bands like Poison and Guns 'n' Roses also debuting this week in 1988, the appearance of this group who'd been big in the 1960s and '70s with songs like "Nights In White Satin" and "Go Now" seems more than a little out of place. The first single from Sur La Mer, "I Know You're..." wouldn't progress much further - no doubt because it sounded incredibly dated, even for 1988 and even though only two years earlier, the similar sounding "Your Wildest Dreams", had been an Australian top 20 and US top 10 hit. "I Know You're..." was actually a sequel to "Your Wildest Dreams", with the music video carrying on the storyline started in that earlier track. It wasn't their debut single, but "Sweet Child O' Mine" (the third release from the Gunners) was the first track to make any impact in Australia. The song, like so many other classics throughout the rock era, was written "in five minutes" by the band and quickly established them as the coolest new music act around. 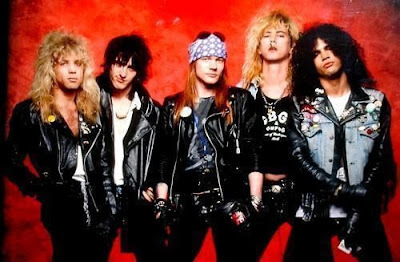 Harder sounding and grittier looking than the pretty boys of Bon Jovi, Poison and Mötley Crüe, Guns 'n' Roses arguably paved the way for the advent of grunge in the 1990s, if only by making flannelette shirts a must-have item of clothing. In previous single "Better Be Home Soon", it had appeared that Crowded House had the goods to continue their unbroken streak of classic pop/rock releases - but that all came to a crashing halt with this second single from Temple Of Low Men. What would have been a decent enough album track ended up being a disappointment as a single and, despite the presence of "Better Be Home Soon" as a B-side, "When You Come" floundered on the chart. Three subsequent singles from the album, "Into Temptation", "Sister Madly" and "I Feel Possessed", all missed the top 50 entirely. With John Farnham proving the Australian record buying public was more than ready to welcome back music stars from decades past, the former Sherbet singer and solo star in his own right resurrected his music career with this radio-friendly pop/rock track. It was no "You're The Voice", but "As The Days Go By" and the accompanying album, Edge, were just the kick-start Daryl's career needed after a four-year absence from the charts and gave him his highest charting track (solo or with Sherbet) in 10 years. There were two clips shot for "As The Days Go By" - there's a link to one in the song title above and the other is below. Next week: it's a bit of a slow one on the singles chart, so I'll take a look at what was happening on the albums chart 25 years ago as well. Meanwhile, I'm hoping to start my countdown of my favourite songs from 1997 soon. Watch this space - or should that be (blog)spot? I don't think I've listened to 'Chains of Love' before. I didn't really know 'Glory! Glory!' until getting hold of the video earlier this year. While I like the song, it was a strange choice for following up 'Underneath the Radar', given it's quite different and not nearly as immediate. As far as Poison tracks go, I liked 'Fallen Angel'. It is surprising that the Morris Minor & The Majors track was much bigger here than in the UK. John Deacon from Queen also makes a cameo in the video as the tea boy. I first heard the Moody Blues track when it crept into the lower region of the Take 40 Australia chart. It's a nice song, but I remember thinking it was music for "older" people... like my parents, maybe. 'When You Come', in retrospect, is a slightly questionable song title... especially for a squeaky clean act like Crowded House. I think the problem with the song is that the chorus doesn't really know what it wants to be. It's OK, though. 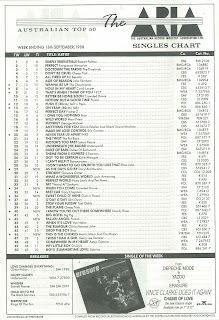 'As the Days Go By' was oddly #1 for a week on the Take 40 Australia chart, based on what I don't know, before it switched to following the ARIA chart in January 1989. So, for years, I thought was actually a #1 single. I wasn't aware there was a second video for this.